Karrimor SF (Special Forces) bags are provided to the military and Special Forces on governmental contracts because they're regarded as the very best load carrying equipment that money can buy today. Karrimor SF bushcraft rucksacks are not the run of the mill Karrimor bags that are often seen in high-street stores, the Karrimor SF range are specialist pieces of equipment that really are the best of the best. The Karrimor Special Forces range of bags, packs and rucksacks provide a superior level of weight distribution and sweat wicking materials that make them the chosen bag for serious survival situations, hikers, walkers, survival professionals and bushcraft instructors. These Karrimor SF rucksacks use a thicker, stronger material meaning they're up to the most demanding of of survival tasks. Each Karrimor hiking bag has a vast amount of attachment points, meaning you can expand their size, and also attached various rucksack accessories and other add on components. The Karrimor SF range of rucksacks comes in the very popular standard military olive drab, coyote, black and digital DPM (camo). 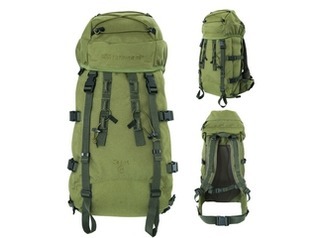 Karrimor SF rucksacks and bergan's really are the best bushcraft and survival rucksacks available to buy today, and here at Greenman Bushcraft we're proud to be offering these bags at incredibly low prices.